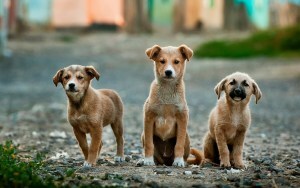 this week our prompt consisted of several photographs with dogs in the pictures. I chose these two pictures for my story. 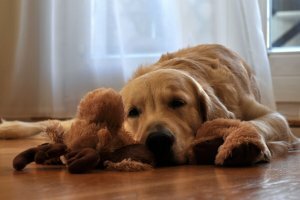 I know Goldie was more or less happy with me here but sometimes she seemed so sad and suckled her cuddly toy. I had so many emotions when I went to pick her up from the rescue centre. I wanted a dog for companionship, I’d never had one before and needed a more mature dog that was already house trained. The centre explained to me that Goldie was classed as a ‘rescue dog’ not because she had been abused in the physical sense but in the sense that the family who had her as a young puppy weren’t really suitable for her. They had young children who were too loud and lively and always hyper, as is the phrase these days. Goldie wasn’t settling, the parents worked full time, the kids had so many social activities that most of the time Goldie was left alone for hours and hours during the day and early evening. The centre told me that when you took on the responsibility of having a dog in your family that dog should become part of the family and part of your life, not an ego trip or something to show off. A few weeks in and I feel as though she is my life. It is only these moments when I know she is sad and I wonder why and what I can do about it. Saturday was a beautiful day, sun streamed in the windows and the park beckoned to us. I packed a thermos of hot tea, a couple of sandwiches and some doggy treats in my backpack, called to Goldie, fastened her lead and off we went. Dog people are so friendly, nods and smiles and endearments to each other’s dogs, although nobody knows each other’s names we are all quite content to let the dogs interact with each other. Goldie and I found a nice bench to have our lunch. Goldie’s ears perked up and she started straining at her leash. I looked in the direction that had taken her interest, three dogs were staring at us. They didn’t seem to be with anybody. As I packed up our lunch things and got ready to leave the park the motley crew decided to follow us. I took a detour and ended up at the rescue centre. Samantha was just locking the door and leaving for the day when she spotted us. ‘What have we got here?’ Samantha bent down to stroke all three dogs. I explained what had happened. Samantha decided to open the centre and check them over. She said she would contact me if she found out more about them. Every week Goldie and I visited ‘our gang’ as we now referred to them. To cut a long story short we are now a family of one lucky girl and four beautiful dogs. Goldie is happy, no more sad eyes, and ‘our gang’ keep me on my toes and have brought joy and happiness to my life. What a cute story with a very happy ending for all!